Nintendo Switch is a real "rising from the ashes" story. Wii U was practically dead on arrival and Nintendo struggled for years to catch up and try to spark momentum, to no avail. Switch took some of Wii U's ideas and refined them, and now the portable/console hybrid is sitting pretty at 10 million units sold in the hardware's first nine months since its March launch. To put that in perspective, Nintendo sold 13.56 million units of the now-discontinued Wii U in the console's entire, roughly 4-and-a-half-year lifespan. I think there are a few reasons for this. When Wii U was announced, Nintendo's message was confusing and muddled, to the point that the average public thought it was a weird new controller for the old Wii instead of a brand new console. In contrast, Switch's debut couldn't have been clearer in its purpose and utility. That reveal trailer still gives me chills. Wii U's hardware was a puzzling hodgepodge, with a powerful GPU bottlenecked by a comparatively ancient PowerPC CPU that made the system perpetually sluggish, and a controller that felt like a confusing, cumbersome half-implemented prototype. Developing for this grabbag of hardware was a chore and thus third party support dried up after the first year. Switch on the other hand is based on the efficient, well-known Nvidia Tegra X1 and its ARM architecture, which are so easy to develop for that Switch has an eminently playable port of Doom. And this brings me to the third and most important distinction: Switch has games, and Wii U just didn't. To be fair there were hits like Smash Bros, Bayonetta 2 and Mario 3D World, but Nintendo struggled to maintain a consistent release schedule and Wii U's lifespan was plagued by several months-long droughts. It's a simple concept and publishers repeatedly ignore it to their peril: if you don't have the games no one is going to care about your console, no matter how impressive the tech is. Switch had an amazing first year with Zelda, Mario, and Splatoon, but more importantly it has strong third party support and an already massive catalog of indie titles. That's pretty incredible and it's not even a year old yet. So congratulations to Nintendo and Switch. It's been a great first nine months and I can't wait to see what 2018 has in store for the platform. 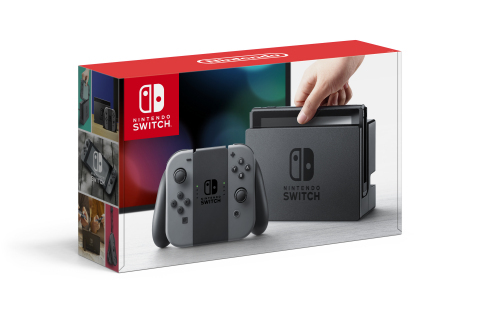 REDMOND, Wash.--(BUSINESS WIRE)-- Despite launching in March, a month not usually reserved for home console launches, and with the busy holiday shopping season still in full swing, the Nintendo Switch system has already sold 10 million units to consumers around the world, according to Nintendo’s internal sales figures. Nintendo Switch is also home to fun multiplayer games like Mario Kart 8 Deluxe, Splatoon 2 and ARMS that can be played online** or with friends and family in the same room, as well as an ever-growing list of great third-party games like Mario + Rabbids Kingdom Battle, FIFA 18, Rocket League, L.A. Noire, The Elder Scrolls V: Skyrim, Golf Story and Stardew Valley, Nintendo Switch is truly for any player. Nintendo Switch is available at a suggested retail price of $299.99. For more information about Nintendo Switch, visit https://www.nintendo.com/switch/. **Nintendo Account is required. Online services and features, including online gameplay, are free until the paid Nintendo Switch Online Service launches in 2018.